I had a dream the other night about robots taking over the world. Perhaps it’s because I watched the Terminator right before bed again, but it was a scary concept. What isn’t scary is the OWI Frightened Grasshopper kit from OWI’s Jr. Science Series. These tiny little robots are constructed to run on solar power and are suitable for children eight years of age and older. It’s a great little gadget for the budding science freak in your household. The build it yourself kit is an educational tool to demonstrate alternative energy principles and introduce you to solar power. In addition to the Frightened Grasshopper, the other kits available in this series include the Happy Hopping Frog, Super Solar Racing Car, Walking King Crab, and Attacking Inch Worm. I’m not sure why the Inch Worm would be an “attacking” kind instead of the “slow, methodical inching” kind. Sounds like a question for science! The Inch Worm, however, is covered with all sorts of spiky bits, so perhaps that is why he’s the attacker and our inconspicuous little Frightened Grasshopper is the timid one. Underneath those long antennae, the grasshopper looks longingly at the ground, trying to blend in. Definitely a scared little bug robot. 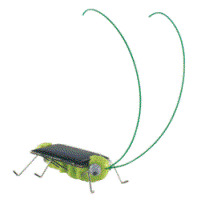 Each OWI Mini Solar Robot kit will set you back anywhere from $20-$25. Great stocking stuffers for your little Einstein in training.